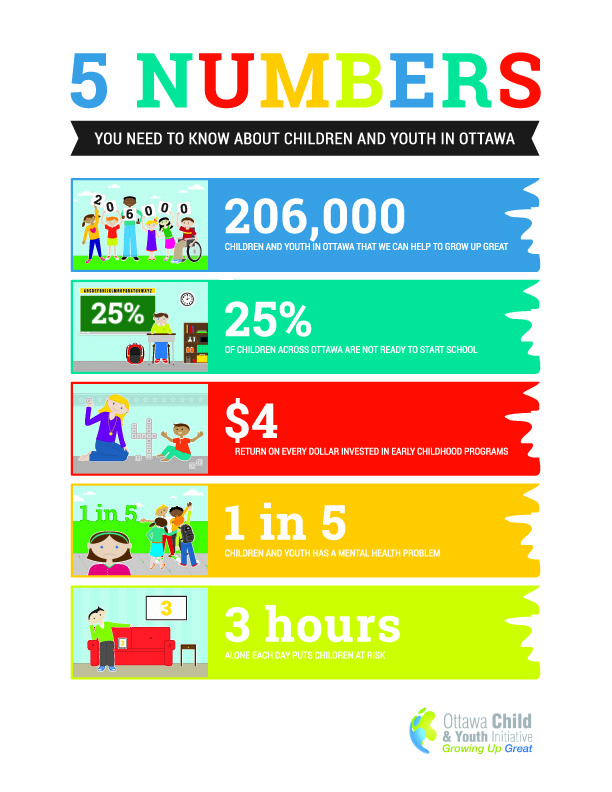 The "5 Numbers You Need to Know" consist of five numbers related to the field of working with children and youth in Ottawa, which the Initiative has decided to focus on over a period of 18 months. They help inform our work toward bettering the lives of children and youth in our community, and helping them to reach their full potential. We encourage all Ottawa Child and Youth Initiative members and partners to promote the 5 Numbers documents, to distribute them in your networks, and to integrate them in your current work. We will also be hosting a series of quarterly "advocacy" sessions over the coming year around each of these key priorities and issues. The sessions are a chance for those interested in the topic area to come together, discuss the issue and current activities and identify if any collective advocacy is needed. Click here to access the 5 Numbers poster (as seen above) and infographics for your organization to use and promote, and to access one-pagers which explain each number in further detail.